Michigan Harvest Gathering is an annual event (September-November) during which food and funds are raised to support our members - the state’s nine regional food banks. The regional food banks serve agencies, such as food pantries, soup kitchens, shelters, etc...in all 83 Michigan counties. Food and funds collected during the campaign are used to support the work of the food banks - to keep their shelves stocked and to assist in the high transportation costs incurred in moving food around the state. 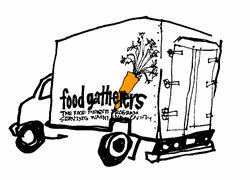 In 2009, Michigan Harvest Gathering collected more than $620,000 and almost 300,000 pounds of food. The 2010 goal is $800,000 and 300,000 pounds of food. The campaign helps supply the state's regional food banks through donations of food and money. The regional food banks serve food pantries, soup kitchens and shelters in every Michigan county. Since 1991, MHG has raised almost $7 million and 8 million pounds of food for hungry people throughout Michigan. About 1 million people in Michigan will need to use a food bank this year. Michigan food banks distributed over 84 million pounds of food in 2009 (valued at over $10 million). Funds are used to transport donated food items in and around Michigan, and to purchase staple food items. Thousands of individuals throughout Michigan donate food and cash each year - including school children, hospital employees, state employees, corporations, foundations, associations and manufacturers. The need for emergency food is increasing - some regions of the state are reporting a 25% increase in the number of people seeking help with food this year! Why Give to Michigan Harvest Gathering? There are many contributing factors to why some Michiganders are in need of our help. Some folks in our communities have temporarily lost their job and don’t have the resources to shop for their week’s groceries. Many are elderly residents who have exhausted their fixed incomes on medications. There are children in Michigan who receive their only nutritious meals from free lunch at school. Unfortunately, hundreds of Michigan residents are turned away weekly from receiving supplemental groceries or a hot meal because there simply isn’t enough. Each year, one in ten people in Michigan rely on the food bank network for emergency food assistance. 50% of those needing help are either children or seniors...both of which are the most vulnerable groups in our state. Every dollar you give, helps provide 5 meals. How Do I Give Local? This year's theme is "Give Local" to emphasize the reality of hunger in Michigan and that money and food raised will support people in local communities. If you would like to donate or become a "food-gathering site" coordinator, please contact Kit Werner at 936-5197 or via e-mail at kitwe@med.umich.edu.